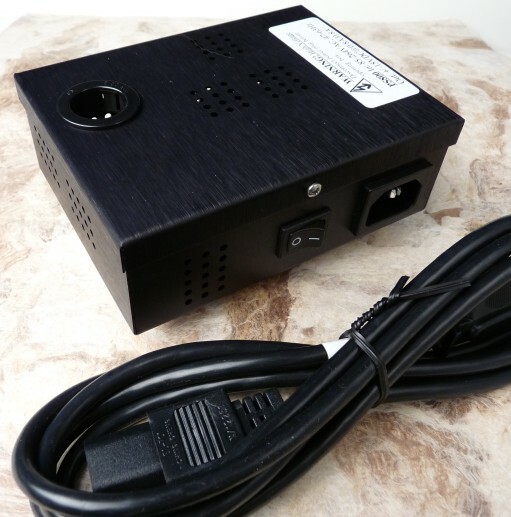 There has been some interest in a replacement for the now obsolete PS505 self contained power supply. We can certainly manufacture an enclosure for the PS800; but with design costs and minimum orders at the metal shop, we need to know what the interest really is. These would be compatible with the PSCONN3 distribution boards which have 18 spaces but could be used with the older PSCONN2 also. Price point is estimated at $129-$149. Drop us an email (blacet@blacet.com) with PS800 in the subject line. So, if there's anyone interested in seeing this happen, get in touch with Blacet and let them know. I told them I'd certainly buy one, at least at the low-end estimate. I wrote and told them that I'd be interested in a version with a metal case (like the PS500) and one without (a "raw" version, if you will). I really hope this happens. There's always J3RK's upcoming DIY PSU board, but it'd be great to have an option on the market that's just ready to plug and play. I have no idea if Blacet has decided to go ahead with this or not. It has not shown up for sale, so my guess is not, but you should email him and ask. 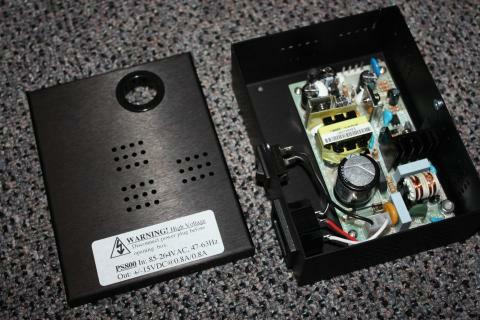 This is the fully contained PS800 with IEC power connector (cord supplied in US and Canada) and power switch. Compatible worldwide with no adjustments. Six mounting holes compatible with old Frac Rak so it can be used as a replacement for the PS505. One four pin power out connector. Use module power cord to connect to a distribution board such as PSCONN3 or PSCONN2 (optionally use PSCONN Cable for the PSCONN2--still available on request). The regular price is $139 but you can preorder for $119. Limit of 2 at this price. Ordered two here as well. Nice. I didn't know they were out yet. Can we have a look inside? The anodized black is SEXXXXXXXY!!! The photo is off the Blacet "News" page. I would bet the inside is the "bare" supply used on the RAK-2. Great. I can mount a connector next to the power switch and replace the plastic grommet with knockout plug. Very convenient. edit: The ones I ordered arrived a few hours after I posted this. How come it's so much smaller than the old PS500, yet puts out more power? Indeed, may have to pick up a Rak 2 rack mount frame, the trade section here seems sadly lacking in Frac stuff at the mo! Is quality better/worse than before wrt cleanliness of power etc? Loved the look of those giant blue covered toroidal mains trannies on the PS505s! Switching technology. It is now in everything and is very efficient. In the early days it was a bit noisy but now is fine. Hard to find linear supplies anymore. They are expensive, heavy, produce waste heat and not good for the whole global warming thing. Thanks, I am grateful for the technical knowledge on here! Are they the same type of thing as these Class D Hypex amps etc., that everybody's going on about recently? Was the old PS500 and PS505 linear, and the new PS800/Rak2 switching? Yep, previous Blacet supplies were linear. Maybe I'm a Luddite but it really disappoints me to see switching power from Blacet, from everyone in Euro, etc. I don't like them. I don't feel they have any place in audio signal chains. Can you explain more why Mike? I'll try and hunt down older PS500/505s if there's a good audible or stability based reason to do so.